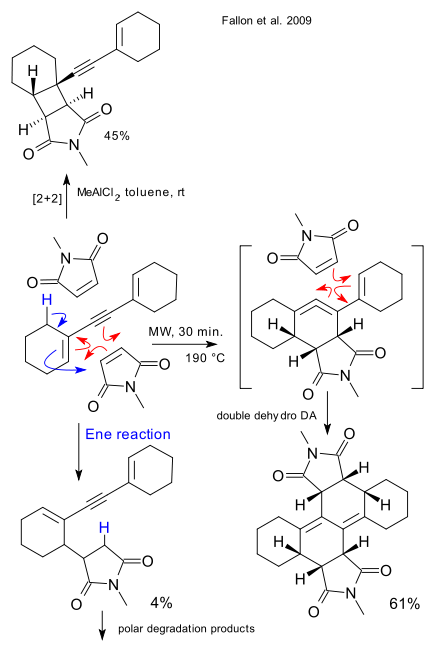 One organic reaction that over the course of a century has been tried but again and again failed to deliver is the double dehydro-Diels-Alder reaction of 1,5-dien-3-ynes. A new attempt by Fallon et al. (DOI) explains exactly why this reaction performs so miserably. The reaction of enyne 1,2-dicyclohexenyl acetylene and dienophile N-Methylmaleimide (5 equivalents, close cousin of N-ethylmaleimide) was improved from bad yields 11-22% to a yield of 61% by making use of microwave chemistry. The ene reaction product was isolated in only a 4% yield but the remainder - a tangle of polar degradation products - is believed to originate from that same ene product. Interestingly only one stereoisomer was found for the product with both dienophile units added in an counter intuitive appearant syn fashion. Every trick known to chemistry has been exhausted in getting the reaction right and even the addition of Lewis acid AlMeCl2 only helped the reactant to escape in a 2+2 cycloaddition.